Participants at the Maritime Safety Authority of Fiji (MSAF) facilitated Safety of Life at Sea (SOLAS) convention and the Tokyo Memorandum of Understanding workshop on December 4, 2018. Photo: Inoke Rabonu. 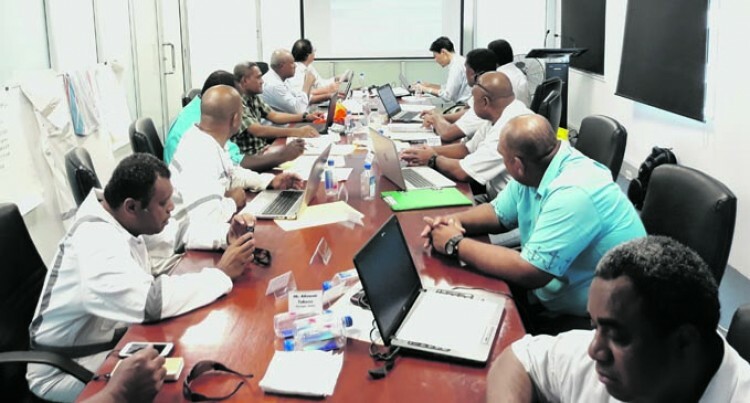 In the quest to align Fiji with the Safety of Life at Sea (SOLAS) convention and the Tokyo Memorandum of Understanding, the Maritime Safety Authority of Fiji (MSAF) is currently conducting a five-day training programme to promote port state control activities in the country. According to MSAF senior technical trainer Malakai Cakau the main objective of the workshop is to train local surveyors to meet with international standards of safety assessment. “The underlining issue for this workshop is to enhance the knowledge of our surveyors so that when foreign vessels come in we are up to par with international standards of safety assessment,” Mr Cakau said. “We conduct these trainings because we want to ensure that ships that are coming into the Pacific and into our ports are standard vessels rather than sub-standard vessels,” he said. “We have about 18 participants in this workshop and they are our surveyors. They are the ones that carry out safety assessments on board different vessels in the country. “The surveyors are divided into two, one are the flag state surveyors and the other are port state control surveyors. “We are trying to upskill our team to do both port state for local vessels and flag state for overseas vessels. Mr Cakau said that the Tokyo MOU has enabled signatories to participate in trainings around the globe and also conducted them at respective countries. “Through the Tokyo MOU we have had the opportunity to send our surveyors away overseas for trainings and this is something that has been beneficial to us,” he said. “We are provided with various aspects of training both locally and abroad. As the regulatory body for Maritime safety in the country, MSAF continues to ensure that vessels coming into the country do not harm marine environment and follow the SOLAS guideline. “Our teams move around the country to inspect vessels. “This is all about the safety of our marine environment, this is all about protecting Fiji’s shores from polluting our environment and damaging our environment. “This year so far there’s about 38 targeted boats that we look closely in, we target only high-risk vessels and we inspect them for improvements every month or two months,” Mr Cakau added. The training facilitators are Kenji Inaba – principal officer, Kobe District Transport Bureau and Norihiro Yabubayashi – vice principal officer, Kinki District Transport Bureau from Japan. “These training facilitators will spend a week with us and we are looking into what the book says, the SOLAS its where we have our rules,” he said. The five day Expert Mission Training Workshop – 2018 began on November 29 and ends today.